Police riot, they want a riot, police riot, a riot of their own! Why should civilians have all the fun? On June 16, 1857, two rival police squads clashed at City Hall: the Municipals, under the command of the notorious Mayor Fernando Wood, and the Metropolitans, acting under the authority of the state. Fernando Wood brought New York City corruption to new heights, and made plenty of enemies along the way. (You can read about his attempt at secession and beef with Abraham Lincoln at this old Janos.nyc post.) There must have been roguish charm about him, though, because he was elected mayor on three occasions after years of running a “grocery-groggery” on the waterfront. In 1857, he was brazenly selling off police titles, an investment purchasers were sure to recoup through illegal shakedowns and other nefarious operations. The reformist state legislature (ah, so refreshing to write that) countered Wood’s corruption by disbanding the Municipal Police and replacing it with the Metropolitan Police, which reported to a commission controlled by Governor John King. (We should stop before we give Andrew Cuomo any ideas.) 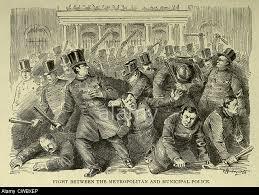 The Municipal Police refused to disband, and the two forces co-existed awkwardly during May and June of 1857. On June 16, Wood and King got into a dispute over who would replace the recently deceased street commission, especially with Wood hiring a street commissioner who had given a whopping $50,000 bribe for the position. The state’s man, Conover, went to work that day as if he were in charge, until Wood’s Municipals threw him out of the building. Things escalated at City Hall to the point that the Metropolitan Police tried to arrest Wood before being driven out of the building by the pro-Wood Municipal Police. A crowd of “suckers, soaplocks, Irishmen, and plug-uglies” gathered ominously in City Hall Park, taunting the “Mets”, itching for a fight. Metropolitan reinforcements arrived, a second arrest was attempted on Wood, and two sides began the Brawl at City Hall, fighting on the steps and through the hallways. By the end of the fight, 53 police officers were injured. After the Mets convinced the commander of a passing navy ship that they had the legal right to arrest Wood, Wood allowed the arrest, though he was released within the hour. From then on, the matter was battled in court, but that didn’t stop skirmishes in the streets. The Munis took particular joy in disrupting the Mets’ arrests, or releasing people the Mets brought to jail. The Mets would do the same when the Munis tried to enforce the law. While New Yorkers began to sour on Woods and his Munis, the Mets also didn’t endear themselves to working class Irish, as they sought to enforce the new state booze laws, including the number of saloons that could operate, the amount a person could drink, and Sunday drinking. Recently there hasn’t been any bad blood between NYPD and State Police that I’m aware of, though I hear things occasionally got awkward during the rebuilding of the World Trade Center and related ceremonies. Fred Dicker also ran a piece yesterday citing a “clusterf*ck” between police agencies chasing our two killers on the loose, but it’s no Brawl at City Hall.